Autumn is a surreal time to visit Acadia National Park, Bar Harbor and the Acadia Maine region. Cadillac Mountain is simply stunning during fall foliage season. Maine’s foliage season runs roughly from mid-September to mid-October, but this varies widely depending on weather, topography and geography. During this time, the deciduous trees of Maine begin their colorful transformation.Columbus Day Weekend is often the focal point of fall foliage excursions although “peak colors” usually arrive well before the end of October in most of northern and central Maine. 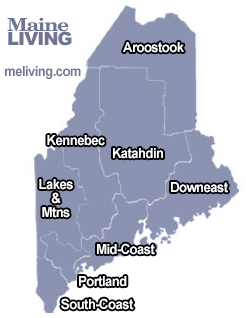 Ask us about ME Fall Foliage or share your Maine Fall Foliage tour comments. To feature your business, contact us. Begin this tour in Ellsworth, where you can tour the amazing Colonel Black Mansion. Built in 1862 with laborers from Boston and bricks shipped all the way from Philadelphia, this grand Georgian home features fine period furniture, a wonderful spiral staircase and lovely gardens. Also in Ellsworth, the Stanwood Homestead Sanctuary is a spectacular 130-acre nature preserve that shouldn’t be missed. Ellsworth offers a lovely downtown, quaint hotels and inns, and fine eateries. Head up Rte. 1 to West Gouldsboro, then take Rte. 186 south to Winter Harbor and follow the loop road around the Schoodic Peninsula. This lesser-known part of Acadia National Park is truly spectacular. Rugged Schoodic Point’s granite cliffs stand in perpetual defiance of the churning Atlantic, and flocks of seagulls play in the sea spray and swirling wind. On a clear day, you can also enjoy amazing views of Mt. Desert Island across Frenchman Bay. Bring a picnic and enjoy one of the best shows on earth: the dramatic interaction between sea, rock and sky. From Winter Harbor, continue on 186 to Prospect Harbor and Gouldsboro, where the Bartlett Estate Winery makes blueberry, apple and pear wines, and offers tasting tours of their wares. Continue north on Rte. 1 to the charming town of Milbridge. Stop to admire the magnificent architecture of the town’s homes and B&Bs, testaments to the area’s 19th-century prosperity. To learn about its colorful past, visit the Milbridge Society & Museum, which, in addition to chronicling the Milbridge of yore, salutes the town’s former doctor, who had a penchant for standing on his head. Head north on Rte. 1 to Cherryfield. Known, ironically, as the “Blueberry Capital of the World,” this stately village is made up of fine old homes (walking tours of its historic district are available) and a park along the Narraguagus River. Located in the heart of wild blueberry country, 12,000 acres of barrens blanket the surrounding landscape and turn a brilliant crimson color in the fall. Continue on Rte. 1 north to Columbia Falls and tour the Ruggles House, an exceptional Federal mansion. After earning his fortune in lumber, Thomas Ruggles had the home built in 1818, employing questionable techniques with his crew: locals claim he required a craftsman to complete the parlor’s intricate wood carvings with a penknife. The process is said to have taken three years, but the result is nothing short of magical. Take 187 south to Jonesport and Beals Island, which together make up Maine’s largest lobstering fleet. Enjoy the towns’ antique shops, galleries, bookstores and restaurants, as well as a stay at one of the local B&Bs. Head north on 187 back to Rte. 1 and continue north to Jonesboro, where you can enjoy the beauty of Roque Bluffs State Park. Do some combing on the scenic pebble beach, or take a swim in the freshwater pond. Further north on Rte. 1 you’ll find the historic town of Machias. Here you can visit the Burnham Tavern, where local patriots planned the first naval battle of the American Revolution in 1775. Happily for them, they found victory: locals captured the British man-of-war, Margaretta, in a skirmish that ended with the ship’s captain dying on one of the tavern tables. Unfortunately for folks further south, the British burned Falmouth (outside of Portland) in retaliation later that year. Today, Machias’ library features a fireplace built from the stones used for the Margaretta’s ballast. If you time it right, you can take in the September Festival at the new Downeast Fairgrounds in Whitneyville, featuring great local food and bluegrass music. From East Machias, head east on Rte. 191 to Cutler, which, as legend has it, was settled due to a mistake made by a sea captain in 1830. One foggy night, Captain Bailey sailed a four-masted schooner aground in Cutler’s scenic bay. Struck by the beauty of the place, he unloaded the ship’s cargo (conveniently, it was lumber) and founded his own little town right then and there. Many of the town’s current residents are Bailey descendants. Continue on 191 to Rte. 189 and head for the town of Lubec, Captain Bailey’s intended destination. The red-and-white striped lighthouse at West Quoddy Head dates to 1858, and occupies the eastern-most point in the nation. Muster yourself out of bed at one of Lubec’s inns and take in a sunrise at the beacon – you can be the first person in America to greet the day. The light’s grounds are lovely any time of day, and this time of the year provides coastal foliage views as crisp and clean as the fresh Maine air. Take a scenic two-mile walk along the cliffs to Quoddy Head State Park, where you can enjoy the season’s colorful ocean views. From Lubec, head west on Rte. 189 to Rte. 1 in Whiting. Take 1 north to Perry, stopping along the way at Cobscook Bay State Park (a fine place for a seaside picnic or camp) and the Reversing Falls in Pembroke – where, a few hours before high tide, seals often frolic in the water. From Perry, take Rte. 190 east to Eastport, the eastern-most city in the nation. Eastport is built on a series of islands connected by causeways. The city’s unique geography gave rise to the its role as a military outpost and, later, a deep-water port servicing the fishing and lumbering industries. Eastport was, in fact, British-occupied for four years during the War of 1812; the 1809 Barracks Museum, originally part of Fort Sullivan, displays old photos and memorabilia chronicling this era of Eastport’s history. While visiting Eastport, make sure you do some exploring on the water. Embark on a whale-watching cruise, or take a ferry to nearby Deer Island – catching a glimpse of the Old Sow Whirlpool (the largest whirlpool in the Western Hemisphere) en route. Also nearby is Canada’s Campobello Island, famed summer home of FDR. Once you’re back on shore, explore Eastport’s downtown, which offers several restaurants, shops and galleries. Take 190 north to Perry, then cut over Rte. 1 south to to 214, then 191 to Baring. From there, head down Rte. 9 through Wesley and to Beddington. Rte. 9 continues to Aurora, where you pick up Rte. 179 back to Ellsworth.